The cold north wind, seasonable as it may be, reminds us that we have an exciting cross country ski season coming up. Time to get the sensitive plants in and time to start visualizing the thrill of gliding on white stuff. The long-range forecasters are predicting a real “cold, snowy winter”; the acorns are continuously bombing us; and the wooly bear caterpillars are abundant. It is also time to renew your membership in the Shenendehowa Nordic Club. Click on “membership” in the menu to the right and get a jump on the season now. We had four families stop by to donate gently used skis, swap skis, and rent for the coming season during the ski swap last Saturday. Folks of all ages are out roller skiing or joining in the HURT training sessions. To put the calendar in perspective. The first day of fall is tomorrow. Feb 28 and Mar 1, 2015 – Mid Atlantic Bill Koch Festival at Osceola, NY. Coach Zimmons will have additional dates to add to these. But these are enough to get all of us excited. Come early to pick out the gems! This is only a first load out of the attic! 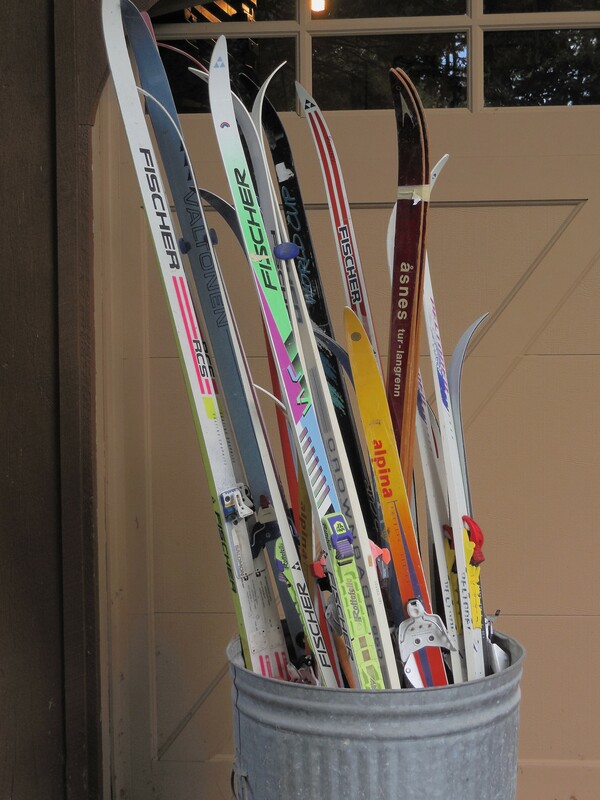 On Saturday, September 20 the Shenendehowa Nordic Club’s youth ski inventory will be open for borrowing, swapping, and purchasing for the coming 2014-2015 season. This will go on from 9 AM until about 2 PM at 67 Pico Road in Clifton Park. Our neighborhood is having a garage sale and a lot of stuff is coming out of my attic including skis. There are beautiful “antique” wooden skis and bamboo ski poles that could be mounted to add to any decor. There are some adult size skis that need new bindings. There are good skis with old three pin bindings that would be good for beginners. the BKYSL skis your youth used last year that will not fit your youth or his/her competitive goals. Hint to all my ski buddies: I get up early and will be sorting through discardable, old, somewhat used and almost new stuff early in the day so come by before the official 9 AM start for the good stuff. There is also a twin sized cannonball bed with frame (no mattress or box spring), a hardwood kitchen chair perfect for the kindling pile, and other cool furniture pieces that might appeal. Come on out on Saturday, September 20, for the Aspenwood community garage sale. …and thanks to my buddy Ed Beisler 522-3432 for organizing this whole thing!